Life has been a bit challenging emotionally for me recently and something happened the other day that had me bawling. You know that kind of crying, where it’s so deep down in your soul you can’t stop till you’re exhausted? All I wanted in that moment was my mum – to be a little girl again, have her put her arms around me and promise me that everything will be all right. But Mum’s been dead for over 12 years, so that’s not possible. I was babysitting my eldest granddaughter yesterday. She’s the spitting image of photos of my mum as a little girl – same hair, same eyes, same determined personality. She started rummaging through some of my necklaces, immediately zeroed in on one, picked it up and handed it to me. 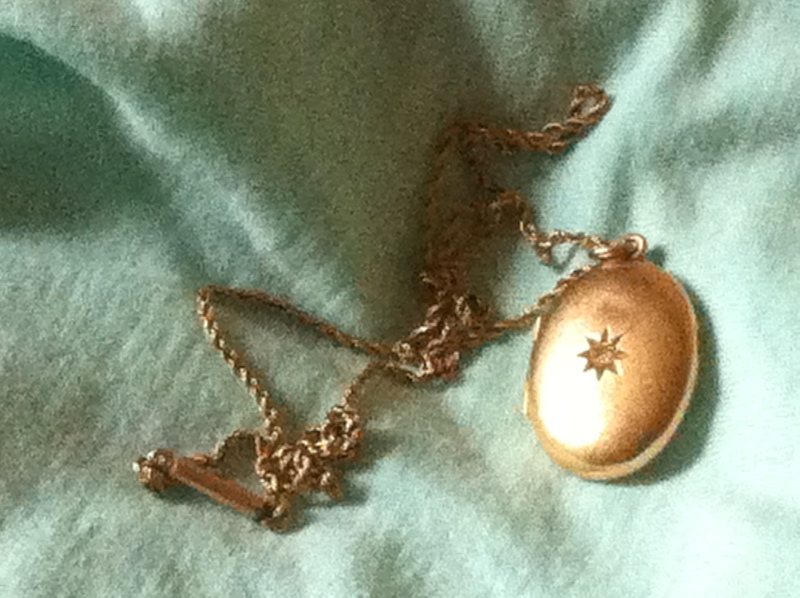 It was my Mum’s gold locket. I put it on, picked up my granddaughter and gave her a hug. She gave me a big hug right back. This entry was posted in Uncategorized and tagged Family. Bookmark the permalink. I got to that stage once – even a bit beyond it:: I ran upstairs, lay face down on my bed, buried my head in the pillow, pulled another one tight down (so the kids wouldn’t hear) over my head, and screamed and screamed and screamed. All the time I was telling myself not to be a fool, but when I sat up[, I felt absolutely marvellous, all tension gone. The family hadn’t heard a thing, I felt good and didn’t have puffy eyes. It does feel better afterwards, though, doesn’t it. And you’re a great inspiration, so I know all will be well. This is a really beautiful post. I know how it feels and wouldn’t wish it on anyone, but then – as you write – an unexpected little sign makes a difference. Things can take so much time and every small positive step is a blessing. Many thanks for your kind words, Vivien.